Polkast: The cloud you have when you’re not having the cloud? Of all the interesting terminology which has passed into the language following the emergence of newer technology, don’t you think that ‘the cloud’ is among the most inventive. I do, yet it is both appropriate and somewhat misleading at the same time. The term itself is a metaphor for the internet and, although it conjures up notions of some kind of infinite ethereal entity, the reality is something else altogether. In the case of ‘cloud storage’ for example, your data is actually stored on physical servers which, despite the inference, are very much earthbound. It’s when you need access to that data that ‘the cloud’ (aka the internet) enters the equation. Storing one’s personal data in the cloud comes with both benefits and disadvantages; the obvious benefits being flexibility of access and, of course, utilizing someone else’s storage space rather than your own. The other side of the coin has been well documented of late with the likes of the MegaUpload scandal and the acquisition of Instagram. Unpredictable events such as these clearly demonstrate that data stored in the cloud is susceptible to the foibles of individual service providers and commercial enterprise in general – a new startup venture called ‘Polkast’ is endeavoring to address those vulnerabilities. 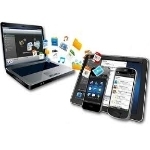 Polkast provides a means for remotely accessing files stored on a home PC from mobile devices, thereby negating the need to utilize third party servers. Obviously the people behind Polkast are looking to take advantage of the current trend toward large capacity local hard drives. Dave's Computer Tips cloud computing, daves computer tips, remote file access. permalink.